I had never really watched this movie properly, but it was pretty entertaining. Most of the laughs come from the hilarious assortment of supporting characters though, not the main foursome. At the Central Park Zoo, Alex the lion (Ben Stiller) loves his life. He gets fed all day on the best steak and is worshipped by every person that comes through the gate. His best friend, Marty the zebra (Chris Rock) longs to see the wild though, rather than be stuck in a cage all day. When celebrating Marty’s birthday, he explains his birthday wish to spend time in the wild to Alex and their two friends, Gloria the hippo (Jada Pinkett Smith) and Melman the giraffe (David Schwimmer). When some nutty penguins organise a breakout of the zoo, the four animals inadvertently end up on a boat to Madagascar. They arrive and except for Marty, they are all desperate to return to their cushy lives at the zoo. The foursome begin to try and find a way back home. Along the way they meet a colony of lemurs who show them the ropes of their temporary African home. Things get tricky when Alex reverts back to his natural instinct to hunt down animals, and the group need to help him remember the lion he was and find a way back home. Given the solid voice cast of the four main characters on hand here, it is really surprising that nearly all of the laughs come from other characters. The crazy penguins are pretty funny and have proved popular enough to get their own spin off film coming out in 2014. The king of the lemurs, Julian (Sacha Baron Cohen), also has some great lines. The role was meant to be much smaller, but when Cohen started recording his line, he gave them far more material than they needed and it was all brilliant so the role of Julian was expanded. I know this is completely juvenile, but the biggest laugh I got from this film was whenever the monkeys were on screen. There are a pair of posh monkeys who pop up from time to time at the zoo and during the break out. The pair have these really posh English accents, that make it even funnier when the pair explain that throwing faeces is the easiest way to get out of a jam. It is completely low brow humour, but it didn’t stop me from laughing pretty hard at them. I definitely laughed at this film a lot more than a I expected too. Given the voice talent on hand though, it is not surprising the film is funny. Madagascar is an entertaining film with a good message about how the grass isn’t always greener on the other side. I am sure there are some animal activists out there who would think that living in the wild would be so much more superior to being locked in a cage all day, but I don’t care. Give me the resort in New York where I get filet mignons every day before any of this stuck in the wild nonsense. Madagascar is an entertaining film that made me laugh more than I thought. There is fun for kids, but enough laughs that it doesn’t put parents to sleep either. I hate to burst everyone’s bubble, but there is no lion, zebra, hippo, or giraffe at the Central Park Zoo. This was somewhat disappointing to me during my trip to New York City, and I’m sure it’s also disappointing to kids visiting that zoo. 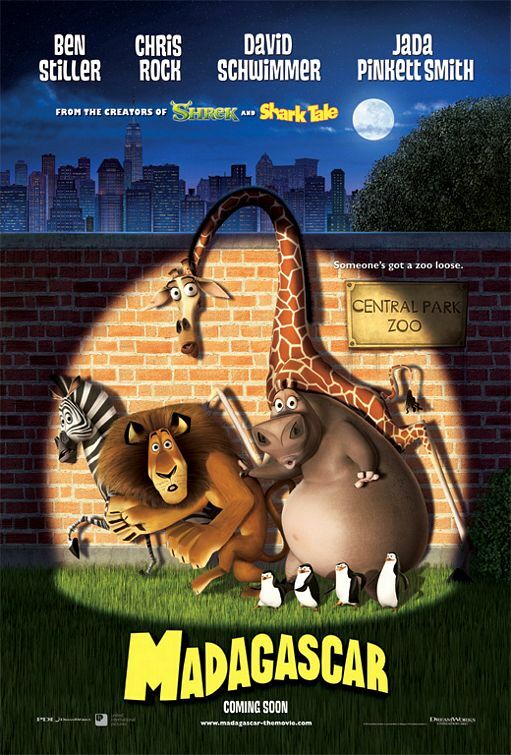 Of course, parents can deflect any tears by reminding their kiddos that of course Alex, Marty, Gloria, and Melman aren’t there– they broke out in Madagascar and escaped the zoo again in movie number 3! It’s still a bit of a letdown, but I’d rather these types of animals be properly housed in larger enclosures at other zoos. Besides, you can park the kids in front of the lemurs or penguins, both of which also feature prominently in this movie. Madagascar is a lot funnier than I remembered. I’d only watched it once before this and liked it fine. This time I was laughing from start to finish. I went through a phase where I absolutely hated any animated movies outside of Pixar, Disney, or Shrek, and I think my first viewing of Madagascar occurred during that period. I still a bit of an animation snob in this regard, but am finding myself growing out of that as I watch more and more movies in the genre. While I enjoyed this film much more the second time around, it’s not perfect. The animation is nicely stylized, but starting to show some age. This is no different than comparing Toy Story to Toy Story 3, and I’m sure the quality of the Madagascar films have improved similarly over time. The big difference here is that Madagascar‘s story is weak. It starts off strong, but falls apart towards the end. The shortcomings in the story makes the OK animation more noticeable, and also doesn’t help the less talented voice work from some of the cast. Ben Stiller (Alex the lion), David Schwimmer (Melman the giraffe), and Sacha Baron Cohen (King Julian the lemur) are excellent, with Cohen being a particularly inspired choice. Jada Pinkett Smith (Gloria the hippo) does a good job, her character just isn’t given much to do. Chris Rock (Alex the zebra) is the weak link here. I never really believe that he is actually a zebra–this is just Chris Rock delivering lines to a microphone. This is an issue, because he is arguably the lead character (at the very least he’s second to Stiller), and his lines need to land better. Still, Madagascar is fun to watch. There are plenty of jokes for the kids and a few that will be better appreciated by the adults. I understand why this has become a successful franchise, though I’m content to skip the sequels.